Crochet hooks, like knitting needles, are largely a matter of personal preference. But, if you ask me, it doesn’t get much better than aluminum Susan Bates crochet hooks. They’re light, they’re comfortable in the hand and on the thumb, they have a gently pointed head that allows them to slip under stitches easily, and they have a sharp, deep hook that holds onto even the most slippery yarn. The best part: they’re widely available AND they’re inexpensive. If you’re going to finish a crochet project, then you’re going to need a darning needle set. I use this 3 needle set from Clover, which comes with a small, a medium, and a large darning needle, plus a small carrying case. Because I can toss the whole set into my project bag without worrying about losing a needle, I always have the right size on hand when it’s time to weave in ends. I always keep a mini retractable measuring tape close by, because they’re perfect for gauging, sizing, and making sure that my projects end up the right shape. I got mine as a birthday gift from my knit-tastic BFF (she got it from our LYS), but you can find one—fancy or not-so-fancy—at just about any craft store. It may be a little bit pricey, but, thanks to this crafting detail lamp, I can crochet black lace with itty-bitty crochet thread. (No, seriously.) If that’s not a ringing endorsement, then I don’t know what is! All kidding aside, a detail lamp makes stitches visible in a way that regular lighting simply can’t, so it makes my projects go faster and keeps me from straining my eyes, no matter what size yarn I’m using. 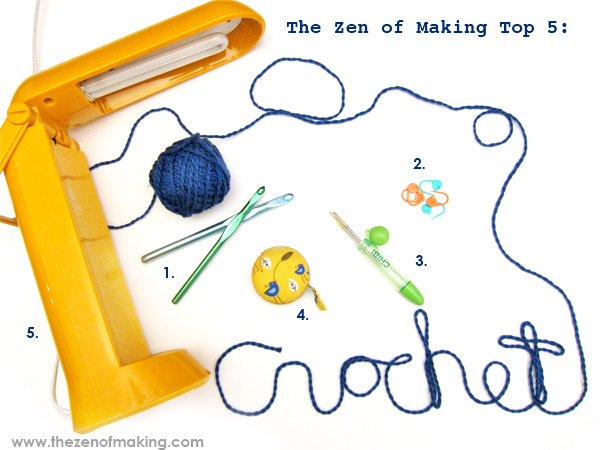 Okay, you fabulous hookers, what amazing crochet tools did I miss? Comment below to add your favorites to the list! I think you NAILED it. Love my CHIBI needle set! and my retractable measuring tape. I use hoop earrings for stitch markers. Ooh. Hoop earrings as stitch markers would definitely add some bling to a WIP!